Our Amish Solid Wood Sofa Table will add an accent to your living room, hallway, office, or entryway while also adding the convenience of two drawers and a solid wood top. This Shaker-style design includes a rectangular top, an apron with unique detail, two drawers, and tapered legs. 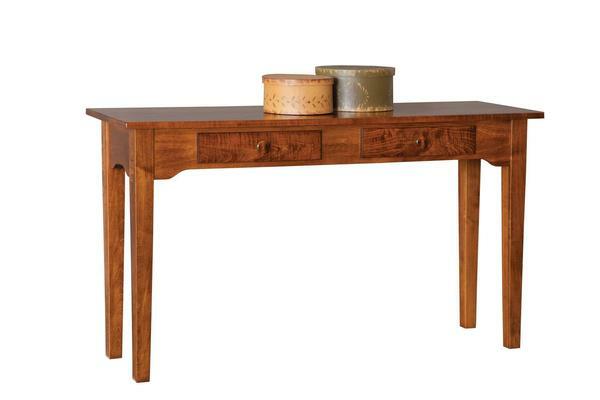 Whether placed behind a seating area or against a wall, this heirloom-quality sofa table will last for decades to come and can be custom-made in your choice of wood type and finish from a variety of options. All I can say is Wow! We purchased four pieces: kitchen hutch, stereo cabinet, custom end table & sofa table all in Washington Cherry. Everything arrived and exceeded our expectations. From the first phone call with Alicia to the final shipping, all the staff was friendly and very helpful. The quality is top notch. If the shipping seems high, it's not when you see how well packed all the items are. If we ever need another piece of furniture, Dutch Crafters will be my place to shop.